In all likelihood, you'll be flying into Spain, unless you're coming overland from Portugal or France, or taking the ferry from Morocco. So it pays to do some reading on airlines, airports, and airfares. These days, most people head first to a price comparison site like the minimalist Hipmunk.com or the text-heavy Kayak.com. Of course, not all flights are the same: Airlines have different hidden fares, some airports are better than others, and there might even be an airport outside of Spain that suits you better. Let's look at the best ways to book a great flight to Spain, including ways that include insider secrets. Which airline has a good deal? It depends. It all comes down to which airline has a good deal at the time you want to fly. You'll have to be careful with some airlines more than others. Transatlantic flights are a tricky business and it's getting trickier, with a lot of larger airlines adopting the surcharge practices of budget airlines (think Ryanair). This can include having to pay to check baggage or for a meal on international flights. Norwegian Airlines charges for both and much more. So a flight that is listed at, for example, $522 will end up costing around $740, after adding $65 per bag per flight and $45 per flight for each meal. (There's also a seat selection fee of up to $45 per flight with low-fare tickets; just skip it and you won't need to pay). Check out all of Norwegian's many optional charges before booking. Wow Air, based in Iceland, also has a big baggage fee, which might make the price per flight no longer as attractive as it once was. Aeroflot has a different problem. What the airline calls a "slight" detour via Moscow will double your time jammed in those tiny seats and can almost triple your total journey time, when factoring in time spent at the airport. Compare prices on flights to Spain with a good price comparison site, such as the minimalist Hipmunk.com or the text-heavy Kayak.com. You're not necessarily tied to landing in Barcelona and Madrid. There are seasonal flights to Malaga, with Delta. And there are flights to Valencia. Always check flight times and total journey time. Sometimes just a few more bucks will get you a much more convenient flight, avoiding lengthy stopovers that necessitate spending money at expensive airports, as well as minimizing the effects of jet lag. If flying with Norwegian, skip the seat selection page (it'll cost you). Just hit "Continue." Consider a direct flight to elsewhere in Europe, and take a budget airline from there. These connections won't show up on a price comparison site because they're not technically connecting flights, meaning you'll need to pick up your bag between legs. Be careful about connecting in London. There are a daunting seven London airports, so it can be hard to get a convenient connecting flight if booking your legs separately. If you land in Heathrow, Spanish carrier Vueling is the only budget airline with flights from Heathrow to Spain. Below are some direct flights from the US to Spain. Check a price comparison site to see the direct connections between your departure and destination cities. Note that in all cases, it will be cheaper (often much cheaper) to get an indirect flight and change somewhere else in Europe. If you're not familiar with Spain, which airports should you consider? Do you have good public transport connections from some of the lesser-known cities or is it even worth considering a short stay at the city closest to the airport? This guide to the major and not-so-major airports of Spain should help you. You often don't need to stay in the city that you fly to. There are often buses straight from the airport to other cities around Spain. For example, from Malaga, you can take a bus straight to Seville or Granada. To find out which bus connections are possible, check out Movelia.es. This is a little trickier. There aren't national train services from Spain's airports. However, in both Barcelona and Madrid you can connect quickly to Sants and Atocha stations, respectively, for high-speed AVE train services and other national routes. These are the Madrid bus and train stations and the Barcelona bus and train stations. This is Spain's largest airport. Madrid is a big draw in itself, as are the nearby cities of Toledo and Segovia. And with the high-speed AVE train departing from Madrid, you can get to many cities in Spain's south and east without the need to get back on another plane. Fly here to get good flight connections to the rest of the country. This is Spain's second biggest airport and second biggest city. For many visitors to the country, it's Spain's best city. And though it is tucked up in the northeast of the country, there are some great internal flights from Barcelona to all over the country, connecting you to far-off cities like Seville and Malaga in a way that land transport never could. Malaga has Spain's third largest airport, but Malaga is not Spain's third largest city. Nearby cities Granada and Seville are far more interesting. Luckily, there are buses straight from Malaga airport to both of these cities, so you don't even need to go into the city itself. Seville is the finest city in Andalusia, Spain's most southerly region. The AVE train connects it to Madrid, via Cordoba, and there are buses and trains to Granada too. Bilbao airport is the nearest to San Sebastian. The two cities are less than an hour apart, making them a perfect two-city break in Spain. Valencia, Spain's third-largest city, has a small-town feel despite its size. The home of paella has good access to the Costa Blanca, but you might need to fly into Alicante instead. In Galicia, see the two main cities of Spain's most northwestern region. Ryanair and easyjet both fly out of Santiago de Compostela, but nearby A Coruña might have a flight for you, too. Oviedo is near Spain's northern coast, serving Asturias and the Picos de Europa mountain range. It's also a good point for reaching Leon. These are minor largely because there are bigger, better cities nearby or because there are few flights there. This is Catalonia's other airport. I recommend flying here for your second trip to Catalonia, if you're not planning on visiting Barcelona. There is plenty to do in northern Catalonia. You can get to Barcelona, but remember the extra travel time involved. Barcelona itself is a far better option if you want to visit Spain's second biggest city, but if there's a cheap flight it's worth considering. Just bear in mind the extra travel time for getting to Barcelona, particularly when taking public transport. It's far more likely you'll have flights to Seville than to here, but if you do get a deal, it's an ideal gateway to Andalusia. Granada is a minor airport, but it isn't a minor city. Flights from Madrid and Barcelona are handy, particularly since Granada isn't on the AVE high-speed train. Almeria is at the far east of Andalusia and so is not as busy as Malaga and the Costa del Sol. Many Wild West movies, Indiana Jones, and a Doctor Who episode were filmed nearby. Santander doesn't have a lot to offer the tourist, so fly to Oviedo or Bilbao if you get the chance. This is wine country. Valladolid can also be a good jumping off point for visiting Salamanca, Leon and Burgos. Zaragoza has a few sights, but its location on the AVE train from Madrid to Barcelona is its biggest draw. There's not a lot to see in Murcia, but it's close enough to Alicante. There was a time when your choice was: Get a stress-free flight with easyJet or risk being ripped off by Ryanair. 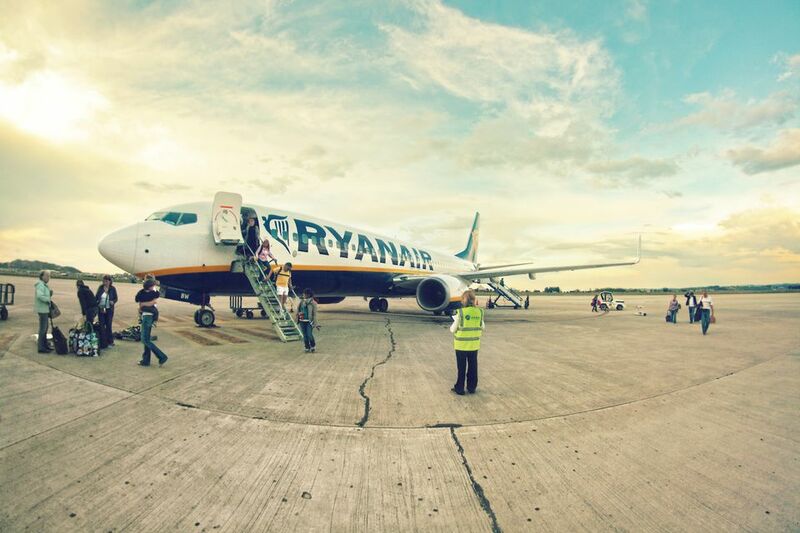 But Ryanair has cleaned up its act and now both airlines are viable options. There are still things to watch out for with Ryanair: There is still a lower weight allowance for hand luggage than most other airlines (though they do now allow a handbag or laptop bag in addition, which even easyJet doesn't permit), and they still make people jump through hoops (such as forcing non-EU passport holders to get their boarding pass stamped by the Ryanair Visa/Document Check Desk, something which no other airline requires). Still, the company's website is a thousand times easier to use than it used to be, and its flights are the equal of easyJet in terms of value. There are three airports in Catalonia: Barcelona airport, Girona airport, and Reus airport. If you're staying in Barcelona, you are far better off using the main Barcelona (El Prat) airport. Only Ryanair calls Girona and Reus 'Barcelona' airports. The Dali Museum in Figueres. You don't need to be an art fan to enjoy the quirky art of Salvador Dali. His museum in Figueres is just 15 minutes from Girona by train. The Costa Brava. Popular resort towns Tossa de Mar, Lloret de Mar, Blanes and Llafranc are all close to Girona airport. Perpignan and the South of France. Though Perpignan has its own airport, a flight to Girona, perhaps taking in the Dali museum on the way, could be a good alternative to flying direct. Also: Here's how to get from Girona Airport to Barcelona. If Barcelona is your destination, here are your alternatives to flying Girona. Barcelona Alternative: Monarch, Ryanair, Vueling all fly Birmingham to Barcelona. Barcelona Alternative: easyJet flies Bristol to Barcelona. Barcelona Alternative: Aer Lingus, Vueling, and Ryanair themselves all fly from Dublin to Barcelona. Barcelona Alternative: easyJet flies London-Luton to Barcelona. Barcelona Alternative: Jet2, Monarch and Ryanair all fly Manchester to Barcelona. Barcelona Alternative: Czech Airlines, Vueling, and Smartwings all fly to Barcelona. Tarragona: The Roman ruins of Tarragona make this a great place to visit. And it's very close to Reus airport. Costa Dorada: Resort towns such as Pineda and Salou are close to Reus and Tarragona. Benicassim: The music festival is held in the town of the same name. It is closer to Valencia airport than Reus, but Reus could still be a good option. Barcelona Alternative: Aer Lingus, Vueling, and Ryanair all fly Dublin to Barcelona. Barcelona Alternative: Vueling and Ryanair fly Edinburgh to Barcelona. Barcelona Alternative: British Airways and Jet2 fly Glasgow to Barcelona. Barcelona Alternative: easyJet, British Airways, Monarch, Norwegian, and Vueling all fly London-Gatwick to Barcelona. Barcelona Alternative: Jet2, Monarch, and Ryanair all fly Manchester to Barcelona. There are airports outside of Spain that can get you quickly to Spain. Ferry: It takes under an hour to get from Tangiers to Tarifa, Spain, by ferry. Faro airport is the main gateway to Portugal's Algarve region. The bus from Faro to Seville takes two hours. Portugal's second city is one of the country's highlights. There are trains north to Galicia, Spain's northwesternmost region. Gibraltar is a tiny British enclave surrounded by the Mediterranean and Andalusia. Walk across the border and you're in Spain, but you still have a bit of a drive until you reach one of Spain's real sights: Jerez is a little over an hour away, Seville is two hours away, and Ronda is an hour and a half away. Portugal's capital is about as far from Spain as you can be in Portugal, but there is an overnight train to Madrid. Lourdes isn't really so close to any prominent Spanish city, but the Pyrenees are close.